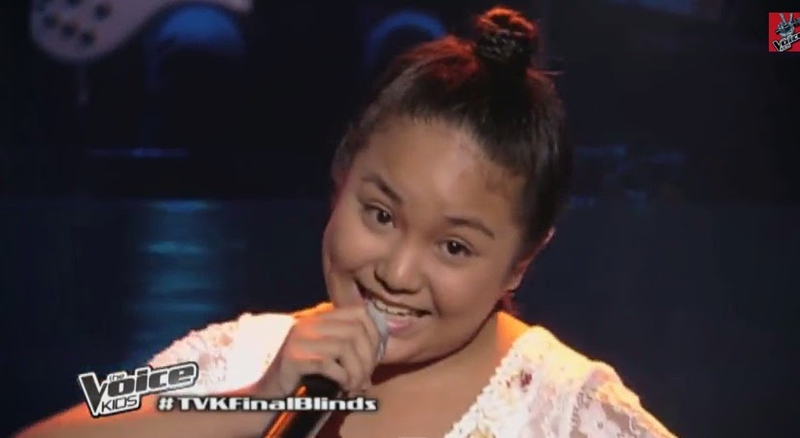 Manila, Philippines - Rein Carmelite Pineda performed a Tagalog song called "Kulasisi" during the final blind auditions of ABS-CBN's top-rating singing reality show aired on Saturday, June 21, 2014. The 11-year old kid from Valenzuela City wowed judges Lea Salonga and Sarah Geronimo. Rein picked Team Lea. As of the June 21 episode, 50 artists have already convinced with at least one coach to turn around, 17 hopefuls getting a slot in each team of Lea and Bamboo and 16 artists on Team Sarah. The Saturday's episode of 'The Voice Kids' dominates online conversations with '#TVKFinalBlinds', 'Next in Line', 'Coach Lea and 'Luis Manzano' among the trending topics. The fifth week of the Blind Auditions signals the anticipation for the next stage of the competition as the coaches build up their respective teams composed of 18 artists. Watch out for the heart-stopping Battle Rounds that will kick off on July 28 and will determine each team’s best young artists. The Voice Kids official Twitter account on Saturday also revealed the other rounds of competition after Blind Auditions and Battles, it includes Sing-offs, Live Semi-Finals, and the Live Grand Finale.